I was taking a walk this morning with my husband at our normal spot which is at the Arboretum. An Arboretum in case you didn’t know, is an area devoted to specimen plantings of trees and shrubs for ornamental purposes, research, and education. It is a very lovely place especially in the spring and fall, to do our daily exercise and to chat with friends that we meet along the way. One friend in particular, Nan, always makes a point to stop and chat. Today was no different. Nan was asking us about our upcoming trip to Arizona and was wanting to know why we were going to such a hot place for our vacation. It is 101 degrees right now there. 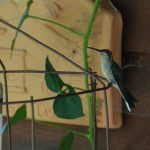 I told her it was to see a variety of hummingbirds and not the Ruby-throated, which is pretty much all we get around here in Kentucky. 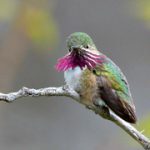 That is because it is the only species found east of the Mississippi other than the accidental hummingbird that may come through like the Anna’s Hummingbird. I will tell you about that bird later. Nan was fascinated by this because she thought there was only one kind. I told her that I thought the same thing up until about six years ago when my husband insisted on taking a birding trip to Southern Arizona because he wanted to see some specific birds that were there. His lure for me was hummingbirds which he knew would get my attention because he knows that they are my favorite bird. When he told me that I could possibly see 15 different varieties of hummingbirds I was hooked. Since then we have made the trip to Southeast Arizona every year and so far have seen 12 of the 15 different types that may be found there. It is always an amazing and fun trip to see Annas, Black-Chinned, Blue-Throated, Broad-Billed, Magnificent (now called Riboli’s), Lucifer, and the Calliope hummers to name a few. I am talking specifically in southeast Arizona, south of Tucson, where the most varieties can be found. Yes, you can see some of the species that I am going to mention in other states but you won’t find as many as you will in southeast Arizona. 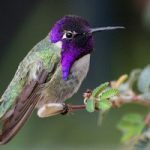 It has to with the the fact that the state of Arizona is a crossroads where mountains, deserts, grasslands, and stream side forests all meet which makes it the “hotspot” for hummingbirds. You can go in the spring to see pretty many of the species I am going to show you which is what we did the first time we went. 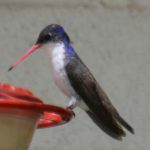 If you are an avid birder and want to see all of the other different types of birds that Arizona has to offer, (i.e. Trogons, Arizona Woodpeckers, Buff-breasted Flycatchers etc.) this is the best time. The birds are all calling this time of year and are easier to find. You still might see the other birds in the fall, but my husband and I have found that without their “call” you don’t always know where the birds are. Since that first time we have only gone after monsoon season which is in July/August. People who live there call it their “second spring” which turns the desert green and brings in a lot of bird activity. 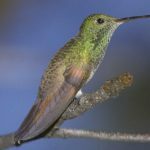 At this time you can see a combination of the resident hummers who breed there, the fall migrants, and maybe even some rare summer visitors and that could be up to 15 different species. Yes, it is hot in July and August, however we always stay up in the mountains at a bed and breakfast which is a lot cooler usually by 20 degrees. So you go down the mountain in the early morning and do all of your birding then come back up if it gets too hot and do some more birding as you cool down. 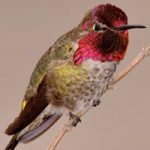 #1 Anna’s Hummingbird – 3.9 inches long and with wingspan is 4.7 inches. 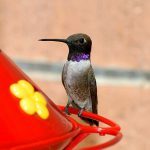 It is considered the most common hummingbird in Arizona and is also a year long resident.. 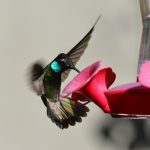 These beauties have iridescent emerald feathers with the males having bright rose-pink throats. Interesting Fact: The Anna’s Hummingbird was named after Anna Masséna, Duchess of Rivoli. 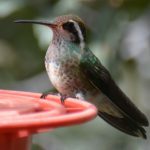 #2 Black Chinned – 3.25 inches – A small metallic green-backed hummingbird . Their bill is long, straight and very slender. The adult male has an irridescent purple throat and a white spot behind the eye. This hummingbird spends the winter in South America. Interesting Fact: Their eggs are about the size of a coffee bean. #3 Blue-Throated – 5.25 inches in length – Considered one of the largest hummingbirds found north of Mexico. It is also the most vocal and are frequent visitors at the feeders. While the blue throat is hard to see on the male in lower lighting, the white on the tail corners are an easy way to identify them. Interesting Fact: This hummingbird is 3 times heavier than the Ruby-throated Hummingbird. The Blue-Throated in the photo is a female. 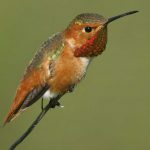 #4 Broad-Billed – 3.9 inches – The male has a dark green back, crown, and breast, with a bright metallic, deep blue throat and a distinct bright red-orange bill with black tip. They are summer visitors. Interesting fact: They do not live or migrate in groups. #5 Broad-Tailed – 4 inches in length – It has a rose – magenta throat with irridescent green back, white chest with a line down its belly. It has a straight bill and a few are residents in Arizona, while others migrate east or west in fall. Interesting Fact: They breed at elevations up to 10,500 feet where temperatures can get below freezing. #7 Magnificent (name now changed to Rivoli’s) – 4.3 to 5.5 inches in length – The male has an iridescent purple crown, green throat, and black belly. These beautiful hummingbirds arrive in late March and leave in late October. Interesting Fact: Magnificent Hummingbirds have one of the highest recorded heart rates of any vertebrate (range 420–1,200 beats/min). 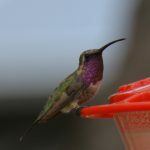 #8 Lucifer – Up to 4 inches long the male is green with a long curved bill, small wings, forked dark tail, and a long irridescent magenta throat. They arrive in late March and leave in early fall. Interesting Fact: This hummingbird belongs to a group of hummingbird species called “sheartails,” named for their deeply forked, narrow tail. #9 White-Eared – 3.5 to 4 inches in length – Both the male and the female have the white line along their eye and neck however the male’s is more prominent. The adults are predominantly green on their upper parts and breast with their underparts mostly white. They arrive late March for the breeding season and leave in October. Interesting Fact: This hummingbird is also known as ‘zafiro oreja blanca’ which is spanish for sapphire white ear. #10 Calliope – about 3 inches long and weighing about one-tenth of an ounce. Its body is green at the top and a buff gray below. It has a short square tail with a black band. The males have a pink-streaked iridescent throat-patch that can be held erect. They arrive in late spring and leave in September. 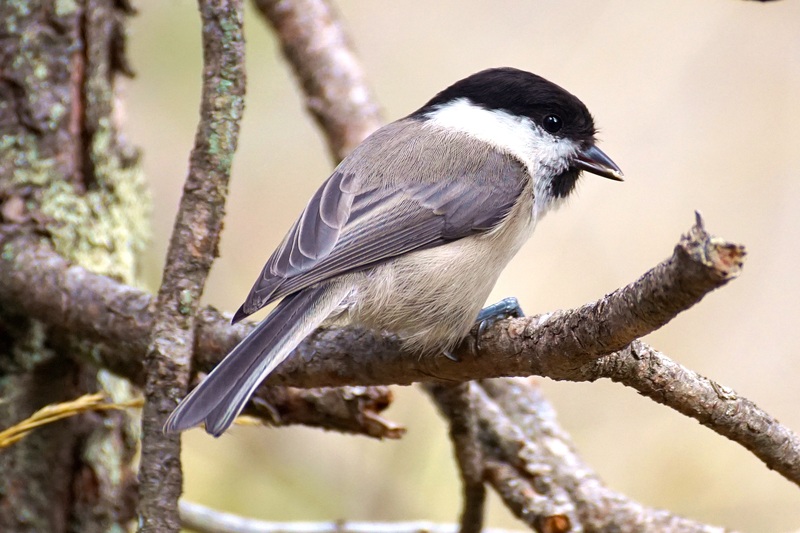 Interesting Fact: It is the smallest breeding bird in North America. #11 Violet-Crowned – 4 inches in length – Its back is emerald and has bright white underparts, an iridescent bluish-violet crown, and a reddish orange bill with a black tip. It breeds between July and September. Interesting Fact: It nests almost exclusively in the Arizona sycamore tree. #12 Rufous – about 3.1 inches in length – The male is a brilliant orange with a long, straight and slender bill. The female is green and orange. They are common from July through October. 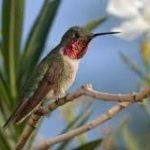 Interesting Fact: They are the feistiest of all the hummingbirds in North America chasing even the bigger hummers without fear. 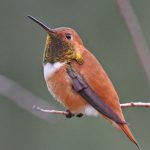 #13 Allen’s – 3 to 3.5 inches in length – the male has a throat that ranges in color from orange-red to yellow-orange, a back that is bright green, a rump that is rufous and its tail feathers are rufous tipped in black. They are considered accidental visitors during spring and fall migration and possibly during the winter and are most often seen in July. Interesting Fact: They are closely related to the Rufous Hummingbird and are often confused when identifying them. 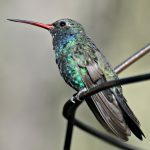 #14 Plain-Capped Starthroat – 4.25 to 4.50 inches long – The male and female have dark metallic bronze upper plumage with a white patch on the back and rump. The underside is a grayish white. The male has a metallic violet-red throat patch seen best in good lighting conditions. It is a very rare visitor and when seen it is in late summer, early fall. Interesting Fact: The star throat is very hard to see in low lighting and can be pretty dull in appearance. #15 Berylline – 3.2 to 4 inches in length – Males and females look alike with shimmering green feathers from their bill to their rump. The color changes to rufous at rump and extends into the tail feathers. They breed July through September and are more rare. Interesting Fact: This hummer sometimes gives a soft three-noted call, sounding like a tiny trumpet. You will notice that I did not mention the females in a lot of these descriptions. That is because they do not have the bright irridescent throats/colors like the males have. Consequently can be harder to identify which species they are. The Berylline male and female hummingbird listed is the only one with the same coloring. Just looking at the photos of these birds gets me very excited to go to Southeast Arizona in a few weeks. My husband and I have seen everyone of these hummingbirds with the exception of the Plain-capped Starthroat which we just missed on our last visit in 2016, the Allen’s, and the Berylline. Maybe we will get lucky this year but if we don’t that is okay with me. I absolutely love seeing all of the other hummers and you can see why. 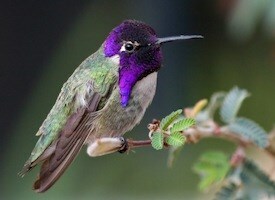 In a future post I will be listing our favorite spots to see all of these hummingbirds. However, I am going to give you a link to a place that we always go to that has a live cam just as a little tease to get you pumped. The link is to Tuscon, Arizona which has Paton Center’s live cam. See if you can recognize the Anna’s, Black-chinned, Broad-billed, and Violet-Crowned which have been present there lately and can be seen live. Pretty cool! 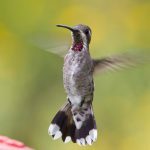 Paton Center Web Cam – See The Hummers In Action! 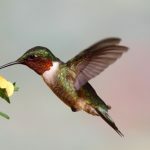 Posted in Attracting Hummingbirds, Birding Hotspots, Hummingbirds.